I’ve long wanted to write an in-depth article about solar power. After all, solar power really is the perfect energy: it’s free, it’s limitless, and it’s non-polluting. But learning about solar energy seemed almost overwhelming. Every time I dove into research mode it was information overload. I didn’t even know where to start. So, I decided to write a series of articles on solar power: the perks and the drawbacks, the costs and the tax breaks, whether to be connected to the grid or go off-grid…the whole nine yards. Today I’m starting with the basics: Solar Power 101. For this question, I turned to the experts. All the information in this section is sourced from a great article in Scientific American, which you can find here. Basically, a solar electric (also called photovoltaic, or PV) system works like this: when sunlight hits the silicon crystals in a solar cell, the electrons in the crystals get up and start moving around. This movement generates an electrical current, which is where we get our electricity. Old-school solar panels used larger crystals, which worked well for converting the sun’s energy into electricity. 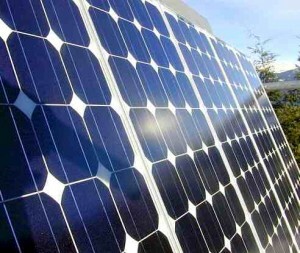 Newer solar panels use smaller, cheaper crystals. This is called thin-film technology. Thin-film technology uses far less silicon, which means they’re less expensive than old-school panels. The rundown? Well, it seems as if thin-film panels give you just as much energy using far less materials, resulting in a lower price tag. And according to Treehugger.com, the costs to manufacture solar panels are 66% lower than they were five years ago. Cost– Spare me the eye rolling for a minute…I know solar systems are pricey. But, this priciness is all relative. They’re pricey (in the short term compared to electricity) if you live in a home that’s already connected to the grid, or if you’re building a home on a lot that’s within a half mile of an electric line. If you live way out in the country (like remote areas of Alaska or Montana) or if you’re building a home that’s more than half a mile from an electric line, do you know how much the utility company will charge you to run a line out to your house? According to the U.S. Department of Energy, a utility company will charge $15,000 to $50,000 or more to run a line out to your house. Ouch. For that much, you could have a sweet solar system. So in this case, it definitely makes financial sense to go with a solar power system. Plus, costs on solar systems have slowly been going down. Like all technology, the more people want it the more money will be invested in its development. If solar energy follows the same path as video recorders, cd players, computers, and iPods, eventually they won’t be so expensive. But, we have to make it clear we want this technology. And as our energy costs keep rising, I’m sure more and more of us are starting to consider renewable energy sources. I’ll be delving into the costs, tax breaks, and payback timeframes of solar systems in my next article in the series. No Pollution- Once the solar panels are installed there is no waste and no pollution. Free Energy- According to SolarHome.com, we get more energy from the sun in one hour than the entire world uses in one year. It’s streaming down on us every day, completely free. All we have to do is harness it. Once you’ve installed your solar power system, your utility bills will be a thing of the past. Small and Quiet- Wind turbines, while super cool, impact the environment because they’re very noticeable and noisy. Solar panels go right on your home, and are fairly easy to install. Costs- Solar power systems can be expensive, and there are a lot of variables to consider. For example, you need to determine how much energy you’re using on a daily basis. And then you must decide if you want a system that will supplement your energy use or a system that will support your energy needs 100%. Most solar power sites estimate that the average household will spend around $20,000 or more for a comprehensive system. Clouds- If you happen to live in a place that doesn’t get a lot of sunshine, or the sunshine you do get is sporadic, then recouping your investment is going to take longer simply because your system won’t produce as much power. Storage- If you opt for a system that will allow you to live off the grid completely, you’re going to need a battery storage system (also called “battery banks”) for your nighttime power needs. These batteries can be expensive, and there is an environmental cost to their disposal. Grid-Tied Systems- This system is the most popular system for homes. Grid-tied systems are fully connected to the electrical grid; they use solar power when the sun is shining, and then rely on grid power when it is cloudy out (or it’s night time). If there is any excess solar power that you don’t use, you sell it right back to the power company. And, you don’t need any storage devices with this system. Grid-Tied With Battery Back-Up Systems- This is almost identical to the regular grid tied solar system above, only with this one you do have a battery back-up system for when the grid goes down for storms or other emergencies. Off-Grid Systems- If you want your home to produce its own power and be completely independent of the power grid, then you’ll want a system that is off-grid. This means that you’ll need enough solar panels to account for all the power you use in a day (accounting for daily and seasonal weather changes), and a battery back-up system that will store all the energy you’ll be producing. Welcome to the “Solar Speeches and Preaches” Brigade! Your membership card is in the mail! Solar Power IS one of the best ways to take control of your own life. I’ve been preaching this same “how to” message myself, on my blog. And there aren’t any moving parts, so I’m not gonna have to get off the couch at gametime, to go fix something! And with no power bill, I have more money for frosty cold beverages to enjoy that game with! Heather, I applaud your efforts here. I found good information that I have NOT seen on other sites. One thing I have found while looking into renewable energies and sustainable systems is that the information is all over to be found, but only if you have the time to perform a comprehensive search. I find your compilations informative, and your spirit of the information true. I see that your site attempts to bring information of the various “green” technologies together in a usable form. I too live in Michigan (Grand Rapids), and during a solar seminar presented by a solar and wind systems installer I heard that if we tie into the grid in this state, battery backups in case of grid failure, are not an option. So, we either stand alone and store all of our generated electricity, or we have no power just like everyone else on a failed grid node. I believe this would be classed as a minor barrier to consumer use of solar energy so far as regulations governing the program goes. Have you found any information that may either support or reject this “either-or” claim? Also, different states currently have different rules for grid-tied systems that directly affect the costs associated with them (of which MI receives a “D” grade compared to other states). I have found that attempts are underway in Congress to develop a national standard to eliminate these policy barriers of different states. I’m really uniformed when it comes to the laws regarding plugging into the grid or going completely off-grid. I’m surprised that, as eco-friendly as Granholm is trying to make MI to be, that there’s such a law like that. I wonder, since she’s pushing wind power so much, if there are rules for tying in with that as well. Thanks so much for bringing this to light; I had no idea that was going on. I need to do a post about tying into the grid or going completely off-grid anyway! Hey everyone, I just ordered this Home Made Energy guide and its freiking amazing! I came across your site and the question about grid tie with battery back-up. You can still tie into the grid with a battery system and have the best of both worlds. There are no laws against this and we have many customers tied to the grid this way.